Click here to view historic sales data for West Colorado Springs. 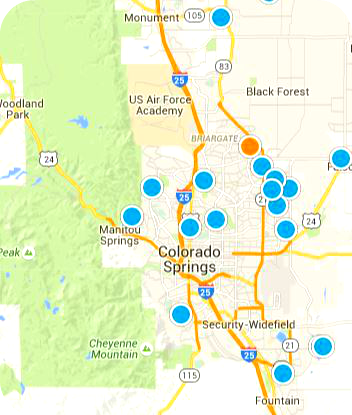 Scroll down to view the latest listings in West Colorado Springs. West Colorado Springs encompasses the edges of several other communities and its own small portion of residential area just to the north of Old Colorado City and to the west of downtown Colorado Springs. Being so centrally located, this neighborhood offers quick and easy access to the best local attractions, restaurants, shopping, and recreational activities. Much of west Colorado Springs is reserved for outdoor activities, including over 2,500 combined acres of space at Red Rock Canyon Park and Garden of the Gods Park. Both of these areas include trails, rock climbing locations, and beautiful views. Additionally, Sondermann Park, Monument Valley Park, and Rock Ledge Ranch provide even more opportunities for relaxation or exercise. In the heat of the summer, membership at the Valley Swim Club or nearby Garden of the Gods Club both include outdoor pool usage. A few popular restaurants in the area have garnered a lot of attention. Barbecue connoisseurs frequent Rudy's Country Store & Bar-BQ, located on Highway 24 and offering dozens of unique menu items. Jun Japanese prepares fresh sushi and a variety of other Japanese cuisine options every day. Also, Heart of Jerusalem Cafe serves up middle eastern cuisine, expanding here from its first location in Manitou Springs. Residents have easy access to several Colorado Springs School District 11 schools, including West Elementary and Middle Schools and Palmer High School, located just a few blocks to the east. Additionally, Academy School District 20 serves all ages of students in the community in both traditional and online classrooms, and remains the highest achieving large school district in Colorado. Further amenities can be found in the nearby neighborhoods of northeast and northwest Colorado Springs and Manitou Springs.